Chessington, UK, 18 September 2018: European operators looking to overcome poor fibre cleaving and increased costs are set to benefit when leader in optical connectivity and splicing technology, Fujikura Europe, introduces the latest addition to its record-breaking fusion splicer product line, the 41S at ECOC 2018, Rome, September 23-27. By working wirelessly with the new CT50 fibre cleaver, the 41S splicer improves the overall installation time and cost for operators. 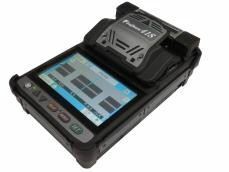 Designed for FTTX, data centre, LAN and access applications, the future-proof smart splicer has active v-groove alignment and boasts innovative features in a compact and robust package. It has been upgraded from its predecessor, the 22S, and can now deliver accurate core splice loss estimation – a feature not previously possible until now. The issue of poor fibre cleaving due to worn, incorrectly adjusted or damaged cleaver blades is conveniently dealt with when the 41S detects a high cleave angle or bad end shape on the CT50, it sends a blade position change instruction to the cleaver. The cleaver then rotates the cleaver blade automatically to the next position, restoring optimum cleaving performance. In addition to cleave performance, the smart splicer can also wirelessly monitor battery and power usage of the CT50 cleaver. The 41S comes enabled with a touch screen menu as standard, but also maintains the traditional easy-to-use hard button navigation system. By utilising the low radio power of Bluetooth technology, other equipment nearby will not be interfered with. Operators can benefit from the “always on” technology due to the low power consumption of the Bluetooth, which means that the CT50 batteries can last for several months. Installers also have the ease of a 5” colour touch-panel display, improved v-groove illumination and the benefit of easy splice protector positioning. The 41S, along with a full range of Fujikura Europe’s fibre optic solutions, will be on display at Stand 226 at the Fiera Roma, in Rome, Italy from the 24 – 26 September 2018. Fujikura has been represented in Europe for over 30 years, and in 1988 established Fujikura Europe Ltd as a European base of operations in South West London. Fujikura Europe has grown considerably in the last ten years and now occupies a 14,000 sq. ft site in Chessington, Surrey which houses the company’s European sales administrative offices, technical support centre and service repair workshops.